It’s official. 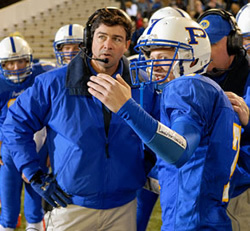 After a weeks of keeping our fingers crossed, the powers-that-be at NBC and DirecTV have hammered out an agreement for two more seasons of Friday Night Lights. Friday Night Lights revolves around a high school football team, its players and surrounding community. The large ensemble cast boasts performers like Kyle Chandler, Connie Britton, Zach Gilford, Minka Kelly, Taylor Kitsch, Adrianne Palicki, Jesse Plemons, Aimee Teegarden, Gaius Charles, Blue Deckert, Scott Porter, Derek Phillips, Brad Leland, Liz Mikel, Stacey Oristano, Nieko Mann, Kate Krause, Kevin Rankin, Louanne Stephens, Josh McVaney, Pablo D. Flores, Katherine Willis, Joey Truty, and Jeremy Sumpter. Though the drama has a devoted core audience and is often praised by critics, it’s struggled to attract a widespread audience. Lights was barely renewed for its first and second seasons. Faced with cancelling the show last March, NBC made a deal with DirecTV to share the cost of producing a third season. As part of the pact, the satellite TV provider began airing the episodes last Fall and NBC started running them in January, once the DirecTV airings had finished. By all accounts, DirecTV has been happy with Lights’ performance but they keep mum about their specific audience numbers. NBC has been running Lights on Friday evenings and they’ve been attracting a paltry four million viewers and a 1.3/4 in the prized 18-49 demographic. Without the DirecTV partnership, it’s obvious that the Lights would be cancelled. How do you watch Lights? Supposedly the renewal deal was essentially wrapped up last week but then some more financial issues needed to be hammered out — regarding how much DirecTV would pay to run the episodes first and commercial free. According to Variety, It looked like the deal was off at one point but then everyone thought better of it and a deal was finalized. It’s believed that DirecTV ends up paying for a bit less than half of the show’s $2 million per-episode budget. Execs at Universal Media Studios and Imagine (who own the show) were especially eager for the deal to go through because the double season renewal would bring the series’ episode total to 76, a decent number for a syndication package. Under the new deal, DirecTV will once again have the rights to air the show first, with a second window for NBC. The series will continue to be shot in Austin, Texas which helps keep costs down through tax incentives. The fourth and fifth seasons, made up of 13 episodes each, will be filmed back-to-back which will help to reduce production costs even more than usual. He’s excited about the prospect of knowing that he has a full 26 episode commitment to play with, a luxury that is unheard of today.”That helps infuse the show with energy and gives us a very clear path where we want to go with the characters,” Katims said. Chandler, Britton, and other key castmembers are set to return since they’re covered under long-term contracts. Kelly, Kitsch, Palicki and Gilford, whose characters are graduating from high school, won’t likely return as regulars but will be given arcs to finish out their time on the show.